A sleek, powerful but low glare LED uplight with a variety of output options. Great dimming performance. Using the same light engine as the Quad range of downlights, the LED is set deep behind a black baffle for reduced glare. Great for uplighting columns or, with a wider beam width, a wall wash. It's recommended for internal use only, it is IP65 rated from the front but the back is not sealed. The Standard engine delivers a punchy 948 lumens making it directly comparable with a high quality 50w low-voltage Halogen light, and very good colour rendering (85 CRI). The very high output version delivers a fantastic 1249 lumens (and 85 CRI) ideal for particularly tall ceilings, if wanting to use fewer fittings or where high light levels are required. The very high (95 CRI) colour rendering version is perfect when lighting artwork or fabrics, or just when you are seeking the best quality of light available. Very narrow beam fittings are perfect for pin-spotting details or shining a narrow beam up or down a column. It uses an innovative eyeball lens to give a 10° beam and is available both in both 85 CRI and 95 CRI colour rendering. Light output is lower (544 lumens) but it is concentrated in the tightly defined beam. 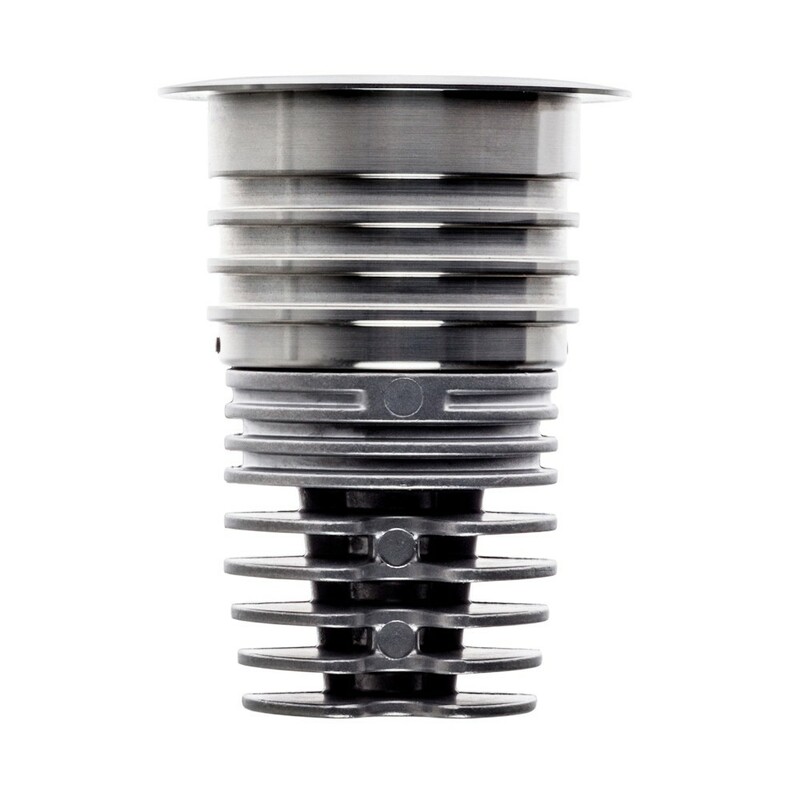 The 10° model is ideal for lighting columns. One driver is required per fitting and driver type is selected via the Options below. Unusually the Quad range of fittings can be dimmed well without using a lighting control system: use the recommended mains trailing edge driver and a recommended Quad rotary dimmer (more details are given after you have added fittings to your Basket). Longevity is achieved with very good thermal management: the fittings have a 70,000 hours life expectancy and a 5 Year fitting warranty. 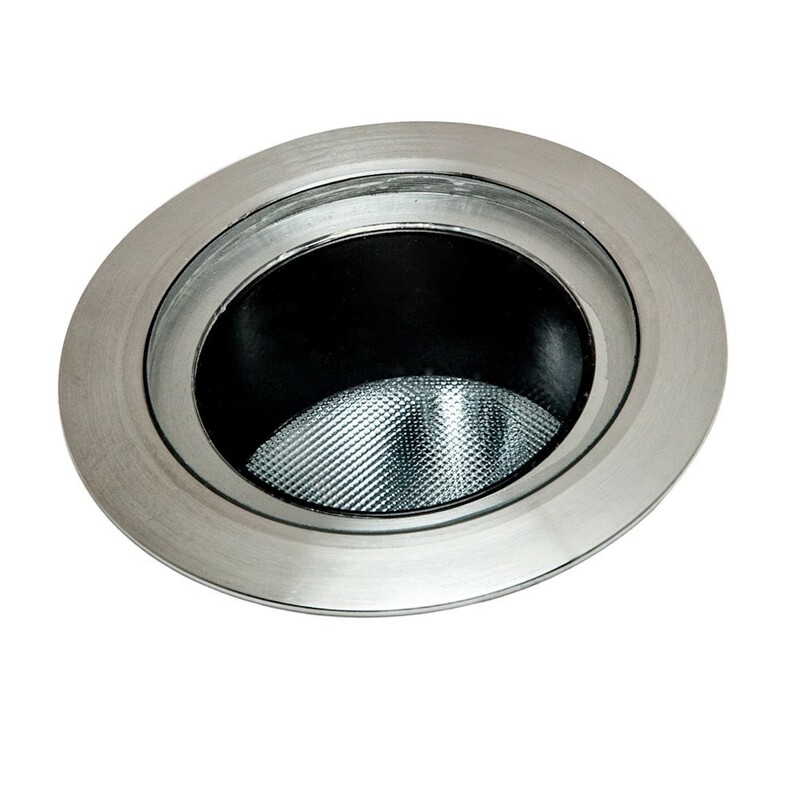 A very sleek, powerful ground recessed uplight with the LED set deep behind a black baffle for reduced glare. Using the same light engine as the Quad range of downlights, it delivers a punchy 948 lumens with a Quad 70 engine. 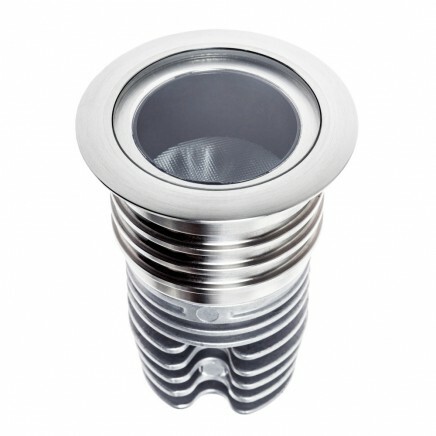 The housing is machined in the UK out of grade 304 stainless steel. Currently recommended for internal use only: it is IP65 rated from the front but the back is not sealed. If mounting in to a solid floor (eg; a concrete screed) provision needs to be made for the fittings at an early stage, before any Underfloor Heating pipes are laid or concrete is poured. They basically need an appropriately sized space left for them in the floor: this can be done in a variety of ways including shuttering, or using lengths of appropriately sized drain pipe in the intended fitting locations. 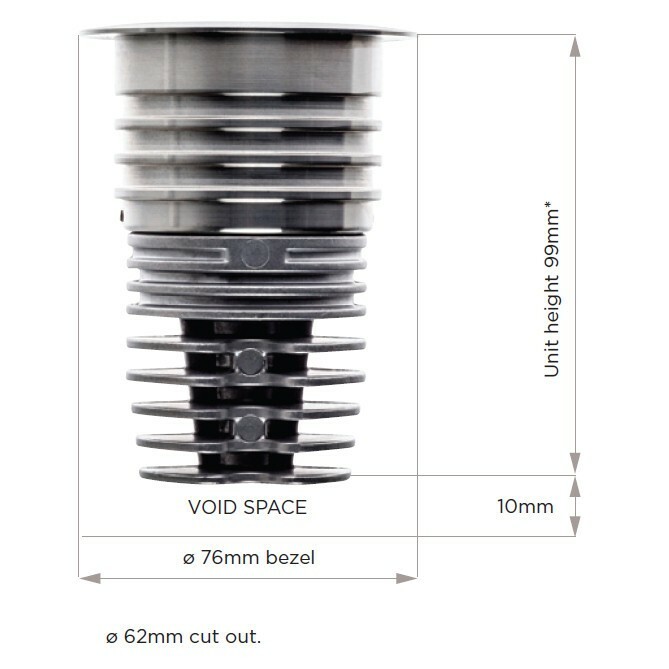 It is advisable to make the void space bigger than the fitting diameter to allow for final location adjustments when the fittings are actually installed. Use with 700mA constant current LED Drivers. Requires one driver per fitting, located remotely within 25m somewhere discrete, allowing air movement, and accessible for maintenance. Use a non-dim driver, or dimmable with a 1-10v driver or a Mains trailing edge driver. 1-10v dimming requires both a power cable and a 1-10v control cable (often Cat5) to be run between the driver and the 1-10v dimmer module. Mains trailing edge dimming requires no additional control cable between the dimmer module and the driver. The Quad range of fittings dim excellently using a combination of Quad fitting + recommended mains dimming driver + recommended Quad dimmer.